The new edition of Collins Italian Dictionary has been completely revised and updated with thousands of new references to cover all the latest vocabulary, culture notes to broaden users' knowledge of Italian culture, and web addresses to enable further research. This is the ideal dictionary for learners of Italian. 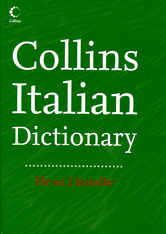 This second edition of the acclaimed Collins Italian Dictionary uses the multi-million word language database, the Collins Word Web, to ensure that the user has the most complete and accurate picture of real language available today.